I have been reading children Bible storybooks all my life. Profound, I know. I have been reading them to my children for 17 years, 10 months, and a few odd days. I have been reading them with the discernment of a Bible believing Christian for 14 years, give or take a few months. There have been some with nice stories. But the Bible meaning and lessons have been washed out. There have been some that get to the bottom of the Bible's meaning but the pictures do not fit Bible truths. (For example Jesus being sprinkled at His baptism instead of being immersed. There have been some with beautiful pictures, like the Tomie Depaola edition. The scripture message was distorted. 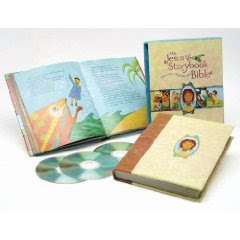 It was not until last year that I finally found a Bible storybook that truly captured all the elements that I was searching for that made it a truly valuable book in our library. 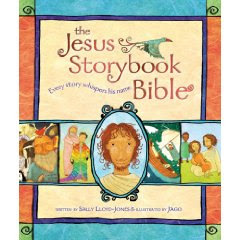 The Jesus Storybook Bible by Sally Lloyd-Jones captures little details from the Bible and weaves them into the beautiful message of love, forgiveness and redemption that God so carefully conveyed in the most special of books and His holy word, The Bible itself. She does not lecture or try to teach morals. No, the author carefully retells the story focusing on the threads of the salvation message in each entry. The subtitle: Every Story Whispers His Name sums it up far better than I can ever hope to. Which is why it became my all time Bible Story book. But not just mine. Samuel, it was a Christmas gift for him, quickly made it his favorite. Each night, as I tucked him in bed he would ask for just one more story. After about one paragraph the entire family would be gathered around listening and asking for just one more story as well. And that is not all. The illustrations by Jago portray the story so artistically that the children, even Elisabeth, will sit for an hour at a time just flipping through the book studying the drawings. This book is so special that it has become my preferred gift to first time parents and toddlers with birthdays. Anyone who knows me in real life has probably already found out what an incredible book this is because I bet your children got one as a gift in the past year. If you haven't yet then there may be one coming your way soon. 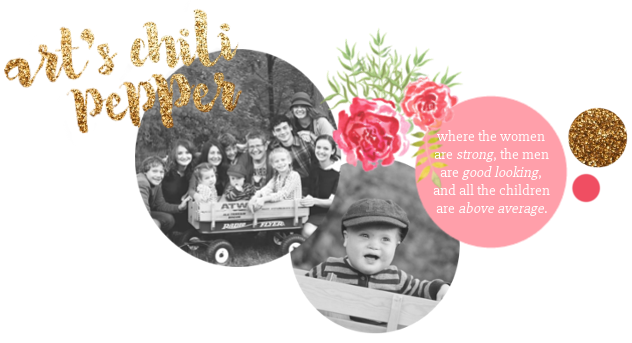 I have had it on my list of posts I wanted to write almost since I began blogging. I have had so many other things to write about that it keeps moving down the list. So you might ask why I am finally getting around to it at this time. And I am glad you asked because I am just itching to tell you. The publishers are getting ready to release a new deluxe edition in October of this year. I will be preordering mine shortly. And this is why. The new deluxe edition will come with audio CD's of David Suchet reading this inspiring book aloud. My first experience with David Suchet is the Agatha Christie mysteries in which he portrays Hercule Poirot. We encountered him next on the amazing Focus on the Family dramatized version of the Chronicles of Narnia where you might recognize him as the voice of Aslan. Side note. If you have not listened to these, and I don't care whether you liked the Narnia series or not or if you are a kid or an adult, you are missing out. In researching the Deluxe release of The Jesus Storybook Bible we were thrilled to read of David Suchet's conversion at the age of 40. Do you still want to know more or are you just dying to get your hands on a copy? Go to Amazon.com where you can purchase the original edition or preorder the deluxe edition, both with a special sale price right now. One more thing. Because you know I always have one more thing. Don't think that since you don't have children this book is not for you. You will have someone in your life that you will want to share it with. That is if you can part with it. 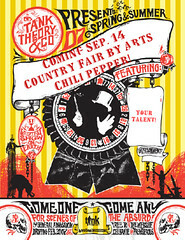 Click on the button to read all about the country fair coming to Art's Chili Pepper September 14th! I also love this book. The story of Adam and Eve being deceived by the lie that God didn't really love them, and that that is the lie Satan tells all the time really hit me. How many times have I read that story, but never did that jump out at me like in this book. Such a wonderful book. And we absolutely love the Narnia set on CD. We are actually on our second set as the first one took a lot of wear and tear. Love it! We also love the movie, but it was hard at first because all of the voices were wrong! And I can't beleive your flooding story!!! And all the other stuff going on at the same time. We are not people that things ever go super smooth for, and it sounds like you guys are the same! At least you get good stories out of it, right?? Pictures of Jesus being sprinkled? Seriously? Wow! Sounds like you finally found a GREAT one! Thanks for the reader's tips! Sounds great Kat, I will have to check it out! Thanks for sharing. I agree...when you get one of those books you want it to capature the bible as close as possible. Glad you found that and are sharing it with other. Don't you just hate when that happens? When you find great books you bought to give to someone else but then you sit down and read them and think, nope gotta keep them. I just might need this someday, or I can pass this down to my kids one day. These are great finds and you are right, it is very hard to part with great finds. Thanks for not only sharing the original but the updated versions as well. Oh that sounds wonderful. I will have to check that out. My kids and myself would love those. I loved Aslans voice. Thanks for sharing this. I will definitely be adding this to our collection...thanks!!! Wow I'm gonna have to check that out! Sounds like something that would be a good idea for a giveaway!